Sometimes, in motorcycling, less power means more fun… and even more speed. More than a decade ago, when the AMA motocross series dropped the 500cc two-stroke class, the 250cc bikes were frequently setting faster lap times. In MotoGP, when the bikes went from 990cc to 800cc a few years ago, corner speeds immediately increased, and, eventually, lap records were broken. Less power sometimes makes a racing motorcycle faster. Strange, but true. Lighter weight and improved handling are generally the reasons. Although nominal weight might be very close, smaller engines have lighter cranks, therefore less crank inertia, and this can make all the difference in terms of handling and corner speed. A few years ago, you might have heard the comment that only Ricky Carmichael and James Stewart could truly use everything a 450cc motocross bike has to offer. For everyone else, including top pros, the engine was overkill. Although 250cc motocross bikes are still generally a tick slower when it comes to lap times, a consensus began to build that something less than 450cc might represent the ideal displacement for the “big bike” class. KTM has a history of offering interesting displacements. In the two-stroke world, for instance, it has offered 300cc and 200cc bikes that have been popular and successful. 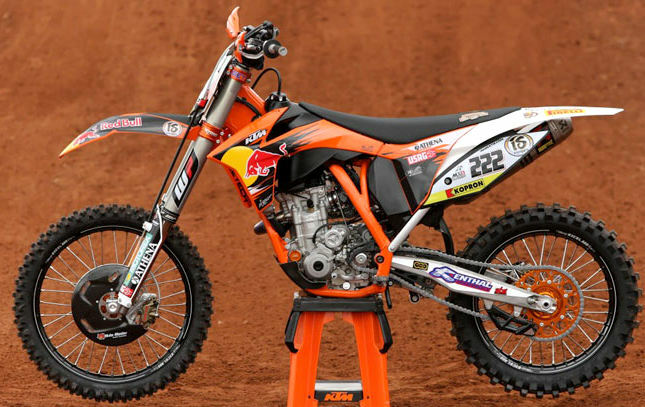 It is no surprise that KTM is the first major manufacturer to develop a bike smaller than 450cc to race in MX1 (the 450cc class in the World Championships). The KTM 350SX-F was announced last year, and is now being raced by MX1 defending champion Antonio Cairoli. Cairoli had his choice (because KTM is also racing a 450cc bike this year) but the champ chose to ride the 350 and his results so far prove he made the right choice. He won on the 350 before the start of the series, and won a moto in the opening round – where he might have won both motos if not for a bad start in one of them. KTM should have a production 350sx available to the public, soon. Most amatuer riders are smart enough to know they can’t use the power of a 450 on a motocross track, and the Japanese would be smart to follow on KTM’s heals. I owned a CRF250X, a CRF450X and a WR250R. I am 1000% convinced, and believe most would agree, that 250 is too little, 450 is too much, and the overall perfect size would split the difference, in other words right around 350cc. I agree the 350 will have only marginally less net weight but its lighter reciprocating mass will produce big handling/attitude benefits. Smoothness always increases riding pleasure. I’m not buying another trail bike till a 350 appears. Wouldn’t it be nice if Yamaha releases a 350 trail version of their latest YZ450 MX? This effect is really due to reduction of mass and, consequently, reduction of the inertial moment about the roll axis of the bike chassis. The center of this axis is the line through the front and rear wheel patches, not the center of mass. A motorcycle behaves essentially as an inverted pendulum. This inertial moment is the primary factor that determines how quickly the lean angle of the bike can be changed. It increases as the square of the distance from the center of the bike mass to the line through the two wheel patches. If an engine is replaced with a lighter engine located such that the center of the engine mass will not change, the overall center of mass for the bike will still be lowered somewhat. The proportional reduction in the inertial moment about roll axis is not simply equal to the proportional reduction in the engine mass. The effect of lowering the engine mass is multiplied by the effect of lowering the square of the distance from the center of bike mass to the line through the wheel patches. The reduction in the inertial moment of the crank will have some effect, as will any change in the inertial moments of the transmission shafts if they are similarly reduced, but in the absence of a thorough analysis proving that their effect is comparable to the effect of simply reducing the inertial moment of the bike about its roll axis, I would hesitate to focus on the reduction of these inertial moments.